Welcome to Lakeside Coaches ltd, the largest coach company in Shropshire with depots in Ellesmere and Wem (Shrewsbury) and also one of the most respected in the UK. The 2016 ROUTE ONE Magazine UK Medium Coach Operator of the Year . With 39 years experience of coach hire behind us, more than 55 vehicles, a dedicated local bus ﬂeet and a staﬀ of over 80, you can be sure you’ll be in safe and well experienced hands with us. With BS EN ISO 9001:2008, CoachMarque and Citation Accreditation our Quality is Assured. Our most recent customer survey shows that 100% would recommend Lakeside Coaches and 94% would rate us as Excellent. This is just a short note to say how much we enjoyed travelling on your new 'executive' coach to Carlisle. Louise is such a good driver, as I am sure you know, and the ride was so smooth, it was a lovely trip. Coach has just arrived back and what can I say.... FABULOUS! Well done Lakeside and your lovely driver!!!! He was helpful, informative and happy! Many thanks for a great weekend and congratulations to Andy our driver with his vast knowledge of London and Julie who managed our passengers on board so well. 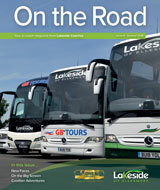 Well done to Lakeside and GB Tours. Keep up the good work. We hope one day to travel again with Lakeside and hope we are fortunate enough to have Tony as our driver. We have been working with Lakeside Coaches for many years now and throughout that time they have always given a first class service. They have consistently provided exemplary vehicles and professional and courteous drivers, who are always willing to go the extra mile for our passengers – something confirmed by the letters and emails we regularly receive from our customers praising their driver. I have been using Lakeside Coaches virtually since I started Gardeners’ Delight Escorted Trips in 2006. So a huge thank you to Lakeside for providing such a professional and reliable service. You have certainly helped my business grow to what it is today.